I’ve read that there are really only a handful of places left in the world where you can encounter a truly natural soundscape, one not impinged upon, and radically reshaped, by the aural residue of human artefacts. That’s very sad but not entirely surprising news. We’re a very noisy species, we humans. In a suburban area on a warm summer evening, evidence of our presence likely takes the form of the clarion call of lawnmowers noisily doing their thing; in a more urban setting, maybe the lower frequency sounds and vibrations of passing streetcars and subways tell of human invention, and social and economic need. But always – and I do mean always – the primary sonic re-shaper of our soundscape is the automobile. Its ubiquity makes it so. From the hiss of tires on wet pavement, to fingers-on-chalkboard sound of the car alarm, to the deep, throaty roar of a high performance engine (and specialized muffler that shapes its sound), the automobile in all its incarnations is the unfortunate “gold standard” of our aural world. Silence is long gone as background. It is the sound of the car against which we now aurally measure the quality (or lack thereof) of our sonic world. Steven Laurie, Tamper. 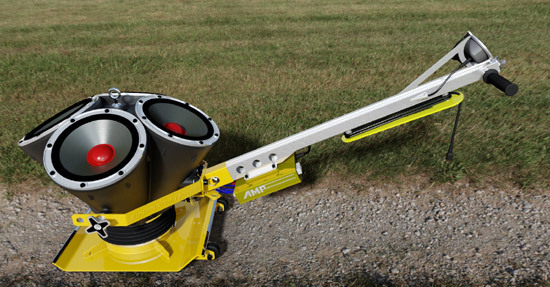 3D Digital Prototype Model. And no, I didn’t forget to mention that unforgettable activity of “burning rubber,” the squeal of tires of a rapidly accelerating vehicle burning its imprint (intentionally or not) onto the surface of a road. I left it for last because here’s where I bring in Canadian sculptor Steven Laurie. Appropriately, he’s originally from the city of Oshawa, just to the east of Toronto, long one of the centers of Canadian automotive manufacturing. He’s also a graduate of the Ontario College of Art & Design in Toronto, and received his MFA from the University of Western Ontario, just down the road in London, Ontario. His sculptural work runs aesthetic rings around our fascination – even obsession – with the automobile. I specifically link him to the car-based activity of burning rubber because of a body of work he his “mark-making machines”. Like Handheld Rubber Burner. It’s a small sculptural work comprising a simple steel framework (essentially two hand-holds, front and back) painted a bright orange and which holds a small gasoline engine, a fuel tank, and a chromed exhaust pipe all powering (by a motorcycle-like chain) a small rubber wheel. 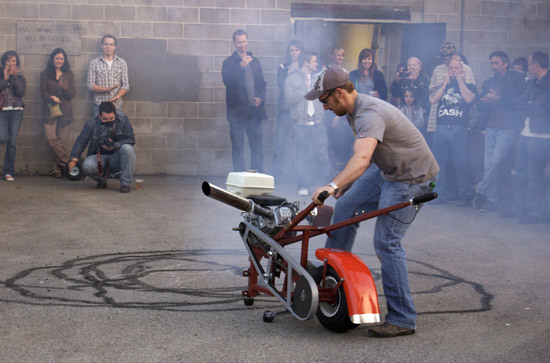 It’s utile, a hand-tool of sorts (think of a powerful masonry saw, which it resembles), and Laurie employs it in performance pieces in which he loudly (and odorously) burns “donuts” – circular marks – onto a paved surface, standing in the middle of the circle, holding it at either end, manipulating the small machine around him as the engine roars away powering the rubber wheel, leaving what are, for all intents and purposes, black skid marks behind. 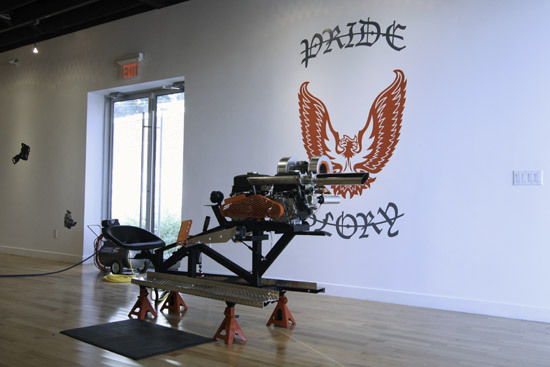 It’s exhibited as a static sculpture in gallery and museum settings (Laurie has shown his work across Canada, in the U.S. and in Europe), alongside pieces like Static Revving Machine. It’s Laurie’s automotive take on an exercise machine. Using stuff you would buy off the rack at any automotive supply store, he’s assembled a sculptural work you can participate in and with: running boards, a metal seat at one end of a steel frame upon which you can precariously perch, a powerful engine – all shiny chrome at the other, and a accelerator pedal. Oh, and even a courtesy mat set on the floor in front of it. Something to wipe your feet on. And the point of it all is power. Seated within the work, the motor can be revved, making a lot of the kind of automotive noise we’ve become accustomed to – if somewhat exasperated by – from young men (and I do intend the gender reference) in their vehicles, showing off, demonstrating the keen edge of what something like testosterone does to a human brain. The difference here, though, is simple yet profound. Static Revving Machine accomplishes absolutely nothing beyond sonic irruption and exhaust fumes contaminating the air. It’s a tool, of sorts, but not a utile one. One cannot of course drive away in the end. Just exercise temporary power over the soundscape courtesy the usual movement of a foot against the pedal of an accelerator. Many of Laurie’s sculptures are like that – utile but useless. His mark-making machines may not accomplish anything profound, but they have a useful utility – of a sort. But Static Revving Machine is part of a collective group of sculptures he calls “sound-making machines. Wild Thing is another small, handheld artefact based on a chainsaw. But in place of the cutting chain there is a carburetor. Wild Thing may start and sound like a chainsaw, but all it accomplishes is the making of noise and the production of exhaust. So too Boom Tube, a small floor work comprising a gasoline-powered motor, long, chromed exhaust tube, and a foot pedal. Placed on the ground or floor in front of a chair, it can be uselessly revved to everyone’s annoyance. Steven Laurie, Stationary Revving Machine. Laurie is, of course, aesthetically commenting on the gadgets and things that seem to excite an awful lot of men (and certainly more than a few women): machines that make a lot of noise while accomplishing small tasks but which denote the smallness of personal power exercised on an environment comprised of everything (and everyone) within hearing range. He’s simply stripped away the tasks, the marginal usefulness of a lot of the devices on which his works are based, and shows them for what they are: infantile toys. But there’s something more profound at work here, too. It’s not merely the infantilism of so much of this class of stuff that he’s pointing out. It’s also the sonic reconstruction of our world that’s been based on it. As a society and a culture, we’ve largely accepted our automotively shaped soundscape as the price paid for the economic model we’ve embraced. And Steven Laurie wants us to take note of that, look and actually hear again what the aesthetics of the motor actually comprises.